Lahore: The Supreme Court spokesperson on Saturday clarified that the incumbent Chief Justice of Pakistan Asif Saeed Khosa does not have any presence on social media. “It is clarified that his lordship (CJP) is neither using any Twitter or Facebook account, nor page, nor any other ID or any other social networking websites,” said the public relation officer of the top court. The clarification came after a fake social media account being operated in the name of the new chief justice came to light. The court directed the Federal Investigation Agency (FIA) and Pakistan Telecommunication Authority (PTA) to block the accounts, IDs and pages in the name of Justice Khosa and pursue legal actions against those responsible.Chief Justice Asif Saeed Khosa On Jan 19, Justice Khosa took oath as the 26th Chief Justice of Pakistan in a ceremony held at President House, Islamabad. 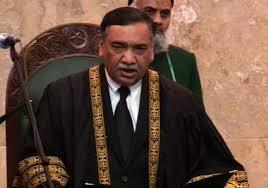 CJP Khosa will serve as the top judge of the country for almost eleven months and is due to retire in December.